Imagine handling a real telescope from an Antarctic expedition. John Collinson Close was a real explorer on the Australian Mawson 1911-1914 expedition to Antarctica. He was assistant collector on the expedition. His telescope is now in the National Museum of Australia. Guess why this story might be called 'Antarctic Close-up'. The Making Tracks series takes young readers on a fictional journey through some Australian stories,inspired by objects from the National Museum of Australia. Other books in the series are based on museum objects such as a Chinese sewing basket from goldrush days, a convict coin and even an outside broadcast radio van from the Melbourne Olympic Games in 1956. Although Hazel Edwards went on an Antarctic expedition to Casey Station with the Australian Antarctic Division as writer-on-ice, in 2001, this story of today's 10 year old John, is faction. Antarctic historical details are accurate. But a little electronic imagination has been added via the laptop web-cam. John loves to fiddle with things but when he connects a broken web-cam to an old telescope,he is in for a shock.Suddenly he finds himself looking back in time, caught in a very 'cool' Antarctic adventure. The National Museum of Australia's Making Tracks interactive website has activities and links to real Antarctic footage. Hazel's other Antarctic books include the YA novel Antarctica's Frozen Chosen, a play in Right or Wrong, the diary 'Antarctic Writer on ice' and a picture book Antarctic Dad. 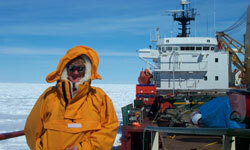 Have you read Antarctic Close-up? Why not send Hazel a comment? You can email Hazel, tweet Hazel or post a message on her Facebook Page.You could also write your own book review. Here are some of the comments online. If you have more why not send them through!